This back-page advertisement by Model Rectifier Corporation (aka MRC) appeared in the January 1972 issue of American Aircraft Modeler magazine. 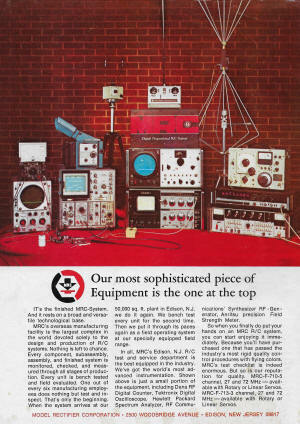 Note the cool collection of [now] vintage test equipment shown in support of testing the R/C system. 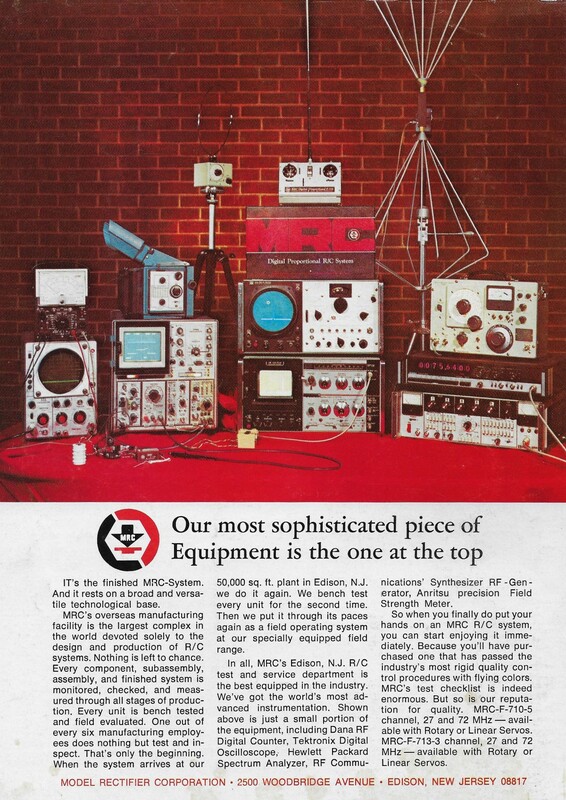 The advertisement shows a rhombic antenna, the Dana 8015 RF frequency counter, Tektronix 7904 oscilloscope, HP spectrum analyzer, RF communications synthesizer RF generator, and an Anritsu precision field strength meter. 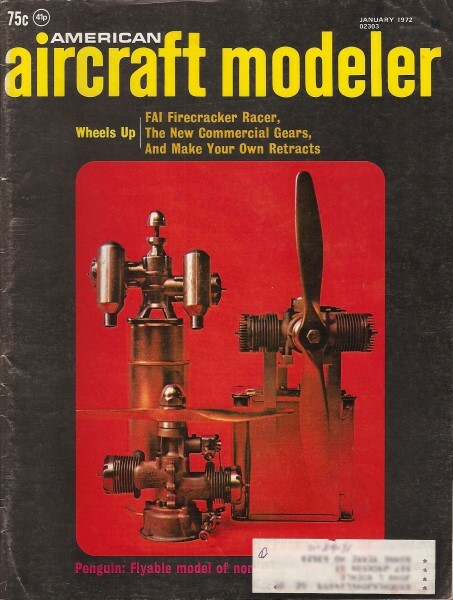 I was 13 years old at the time, and anxiously watched for its appearance in the mailbox each month, then consumed it cover-to-cover each month as I daydreamed about owning and flying very piece of equipment and model featured in it. 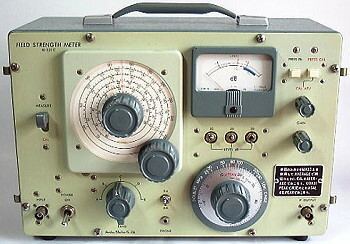 Radio control had only recently entered the realm of digital proportional servo control, and unlike today where all the fundamental circuitry for encoding and decoding the signal is contained within a single, inexpensive and highly sophisticated IC package, R/C systems of the day were built of discrete components. An example is the OS 3-channel outfit that was my first R/C system. Our most sophisticated piece of Equipment is the one at the top. It's the finished MRC-System. And it rests on a broad and versatile technological base. MRC's overseas manufacturing facility is the largest complex in the world devoted solely to the design and production of R/C systems. Nothing is left to chance. Every component, subassembly, assembly, and finished system is monitored, checked, and measured through all stages of production. Every unit is bench tested and field evaluated. One out of every six manufacturing employees does nothing but test and inspect. That's only the beginning. When the system arrives at our 50,000 sq. ft. plant in Edison, N.J., we do it again. We bench test every unit for the second time. Then we put it through its paces again as a field operating system at our specially equipped field range. In all, MRC's Edison, N.J. R/C test and service department is the best equipped in the industry. We've got the world's most advanced instrumentation. 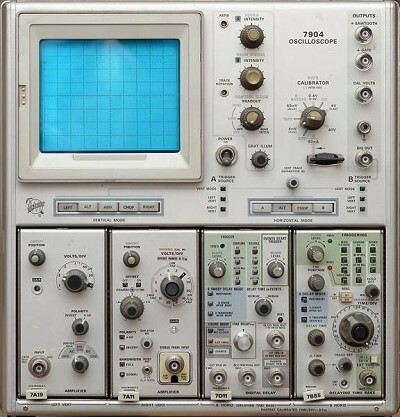 Shown above is just a small portion of the equipment, including Dana RF Digital Counter, Tektronix Digital Oscilloscope, Hewlett Packard Spectrum Analyzer, RF Communications' Synthesizer RF - Generator, Anritsu precision Field Strength Meter. So when you finally do put your hands on an MRC R/C system, you can start enjoying it immediately. Because you'll have purchased one that has passed the industry's most rigid quality control procedures with flying colors. MRC's test checklist is indeed enormous. But so is our reputation for quality. MRC-F-710-5 channel, 27 and 72 MHz - available with Rotary or Linear Servos. MRC-F-713-3 channel, 27 and 72 MHz - available with Rotary or Linear Servos.